We love sharing projects with great photos and especially projects with before and after images so that you can really get a sense of the transformation. 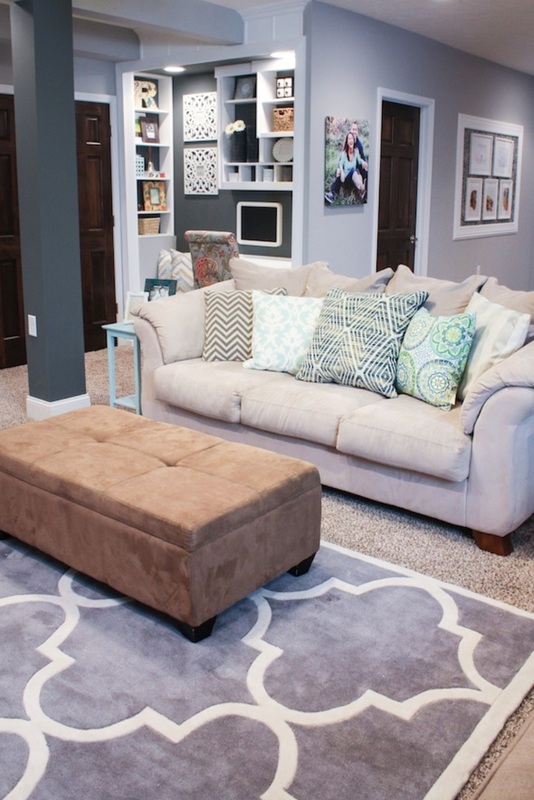 This week we’re sharing a stunning basement remodel. The finished basement looks great but it’s not until you compare the before and after photos that you truly appreciate the completed project. Mandy of The House of Rose blog is one lucky lady. 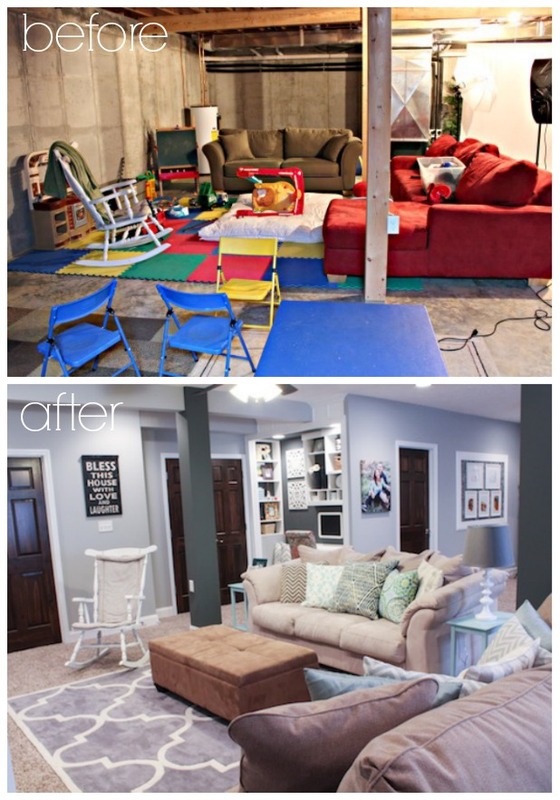 Not only does she and her family occupy an amazing living space, she has a very talented father who was able to transform her unfinished basement into a valuable and beautiful addition to her home. It started out with Mandy thinking she could just ask her dad to frame the unfinished basement in her home. Because most basements have concrete walls and flooring, framing is necessary in order to reclaim the space for a living area. 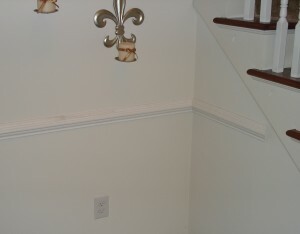 Care must be taken to insure that a basement is water-tight, with no existing leaks or other forms of water intrusion. Vapor barriers need to be installed and when the time does come to frame, it is necessary that the person doing the work knows about offsets, insulation, fastenings, plumbing and electrical requirements. 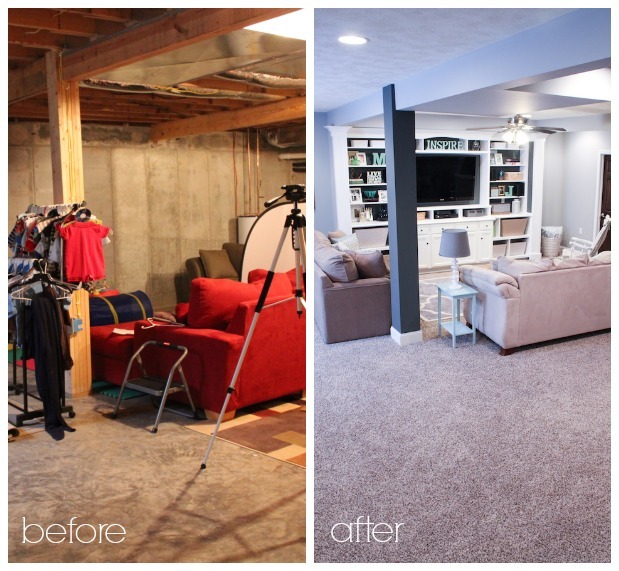 Mandy knew her father was qualified to build the bones on which her basement renovation would hang, but once he got started, she wouldn’t let him stop! Good thing he is a talented carpenter, because by the time Mandy was done he had done slightly more than just reclaim a little living space! First, she wanted built-in bookcases; then she needed an office nook. After that, the idea for a built-in entertainment center fired up her imagination. The end result is a showcase-quality finished basement that probably ought to be featured in a big glossy magazine like House Beautiful. When it comes to finishing your basement renovations, it helps to have the services of an experienced builder and or carpenter in charge of the job. Basement remodels can be a wonderful home addition and add a great deal of value to any future sale. Reclaiming basement space has a few special considerations however, which is why such a project demands the involvement of professionals. Basements must be checked for signs of water intrusion before any construction/remodeling is undertaken. Traces of mold, standing or dripping water are warning signs that can and should derail any planned renovation until such issues are addressed and corrected. It is not enough to just inspect the inside of the basement, it is vital that the foundation outside be checked too. The ground surrounding a house should slope away from the basement, creating a natural source of drainage. Codes and requirements for basement remodels vary from municipality to municipality. It is important to know the laws in your area. You need to know when permits are required and whether or not inspections must be done by city officials while work is in progress. Failing to inform local authorities about home improvements can result in massive fines and the possible condemnation of a living area, so be sure to know local laws. 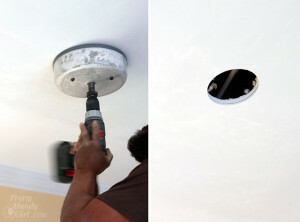 Also electrical and plumbing additions and upgrades must be handled by professionals licensed to do the work. If you have a finished basement remodel with lots of before and after photos please submit your project to us today.